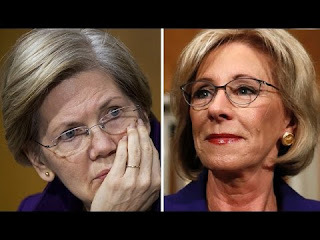 Betsy DeVos is the new Secretary of Education: How About Bipartisan Support for Senator Warren & Senator McCaskill's Bill to Stop Garnishing Social Security Checks of Elderly Student-Loan Defaulters? Any excuse for a slumber party, right? Yesterday, Democrats kept the Senate in session all night to register their opposition to Betsy DeVos as the new Secretary of Education. But Vice President Pence broke the tie vote in the U.S. Senate this morning, and today Betsy DeVos is President Trump's new Secretary of Education. Senate Democrats bitterly opposed DeVos's nomination, but that battle is over. Now is a good time for Democrats and Secretary DeVos to cooperate on a common objective--an objective that should attract broad bipartisan political support. So here's what I suggest: relief for elderly student-loan debtors. Senators Claire McCaskill and Elizabeth Warren supported a bill in 2015 that would stop the federal government from garnishing the Social Security checks of elderly and disabled people who defaulted on their student loans. The bill got nowhere. The Senators also asked the Government Accountability Office to prepare a report on elderly Americans with student loan debt, and GAO delivered that report last December. The report was widely covered by the media and contained some fascinating information. First, "[t]here has been a 10-fold increase in the amount of student debt held by people age 65 or older--from $2 billion in 2005 to $22 billion" in 2015 (quoting the Washington Post). The federal government has increased efforts to garnish Social Security check of student-loan defaulters. According to Senator McCaskill's office, "The number of Americans whose Social Security checks are being garnished by the government to recoup defaulted student loans has increased by 540 percent in the last decade to over 114,000 older borrowers." In 2015, 173,000 Americans had their Social Security income offset due to defaulted student loans. This is a dramatic increase from 2002, when the government only applied offsets to 36,000 Social Security recipients (page 11 of GAO report). Some Social Security recipients whose income was offset lived below the federal poverty guideline and others dropped below the poverty level after their Social Security checks were reduced (p. 27 of GAO report). In fact, as Senator Elizabeth Warren emphasized in a recent press release, "Since 2004, the number of seniors whose Social security benefits have been garnished below the poverty line increased from 8,300 to 67,300." More than 7 million people age 50 and older still owe on student loans, and 870,000 people age 65 and older have student loan debt. Among student-loan borrowers age 65 and older, 37 percent are in default (figure 2, page 10 of GAO report). The amount of money the government collects from Social Security offsets is a pittance compared to overall student debt. The government only collected $171 million from Social Security offsets in 2015, about $1,000 per garnishee. Most of the money collected from Social Security offsets went toward paying fees and accumulated interest. "Of the approximately $1.1 billion collected through Social Security offsets from fiscal year 2001 through 2015 from borrowers of all ages, about 71 percent was applied to fees and interest" (p. 19 of GAO report). Surely, Senators McCaskill and Warren can muster bipartisan support for legislation that will stop the federal government from garnishing the Social Security checks of elderly student-loan defaulters. Perhaps they might ask for a couple of Senate Republicans to join as co-sponsors. I suggest Senator Lisa Murkowski of Alaska and Susan Collins of Maine. Both voted against Ms. Devos' confirmation. And I'll bet Senators McCaskill and Warren could get Betsy Devos and the Department of Education to endorse the bill. At least they could ask. Who would oppose such a bill? I don't think anyone would. What a wonderful message such a law would send to the American people: the message that our elected leaders--Congress and the Executive Branch--can work together to advance the common good. On the other hand, if Congress and the U.S. Department of Education can't cooperate to get this wholly beneficial legislation adopted, then the political process is indeed broken. Sandy Baum. 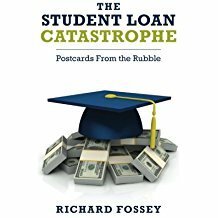 Student Debt: Rhetoric and Realities of Higher Education Financingg. New York: Palgrave-Macmillan, 2016. Jordan Carney. Two GOP senators to vote no on Betsy DeVos. The Hill, February 7, 2017. Danielle Douglas-Gabriel. The disturbing trend of losing Social Security benefits to student debt. Wall Street Journal, December 20, 2016. Senator Claire McCaskill Press Release, December 20, 2016. McCaskill-Warren GAO Report Shows Shocking Increase in Student Loan Debt Among Seniors.